Adobe Photoshop has many powerful tools with the most versatile being the selection tools. Some tools in Photoshop seem to be hidden. Look for a small arrow in the bottom corner, click and hold the mouse button, and the other tools will appear letting you select what you need. Hint: Unsure of the name of a tool? Simply hover your mouse over the tool and the name pops up. Move tool. This allows grabbing selections on individual layers and moving the selections around on the composition or even drag the selection to a different composition. 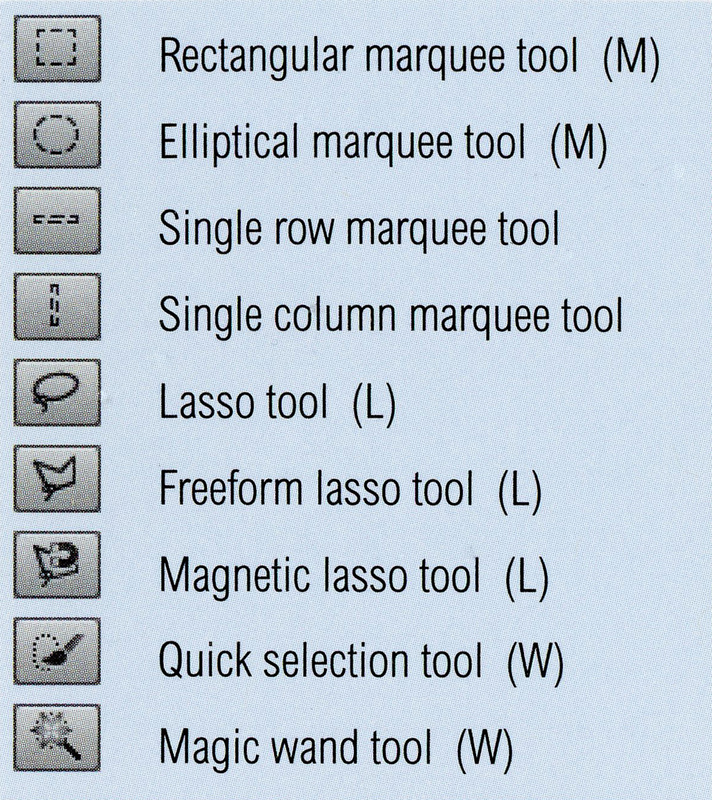 Rectangle marquee selection tool. This creates a selection in a rectangular shape. There are also three tools underneath the rectangle tool: elliptical marquee, single column marquee, and single row marquee. Lasso tool. This allows for free-hand selection. The lasso tool has two other tools underneath: polygonal lasso and the magnetic lasso. The polygonal lasso tool creates a selection using points that you create. The magnetic lasso tool finds the edges of the image and outlines them. Magic wand. The magic wand creates a selection by grabbing all of a certain color based on where you click. Underneath the the magic wand tool the quick selection tool which you use by painting over the area you want selected. On all of these selection tools you have the option to refine edges and subtract and add to your selection, even feather and move the edge in or out. Refine edge provides options for the selections such as leave as selection, create a mask, or make a new layer, too. This entry was posted in DIY FYI and tagged lasso tool, magic wand, move tool, Photoshop, selection tools, tutorial. Bookmark the permalink.